Jeremy Corbyn has said he would support another Brexit referendum - if Labour members at the annual party conference call for it. 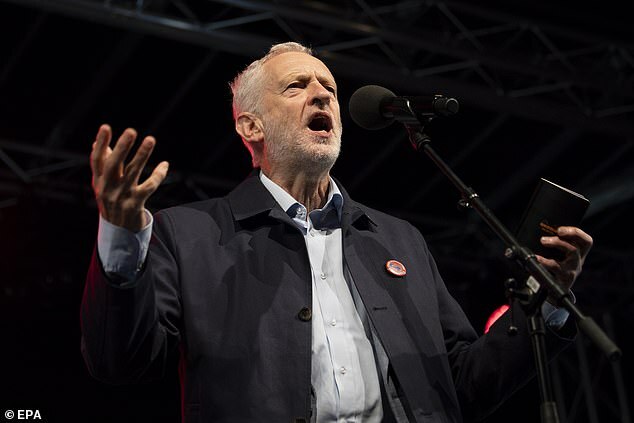 The Labour leader said that he would prefer to have a general election to settle the issue, but admitted he could not ignore calls for a second referendum if party members demand it. It comes after Tom Watson also in a newspaper interview the party should not ignore party members if they make their voices for another referendum heard loud enough. Speaking to the Mirror, Corbyn said: 'What comes out of conference I will adhere to. But I’m not calling for a second referendum. I hope we will agree that the best way of resolving this is a General Election. His remarks come as a poll published by the Observer found 86 per cent of party members think there should be a vote on the outcome of Brexit negotiations. It also found that 90 per cent of Labour members would vote to remain in the EU. Mr Watson told The Observer: 'Jeremy and I were elected in 2015 to give the Labour Party back to its members. In Liverpool today, Corbyn echoed his calls for a general election ahead of the annual party conference. 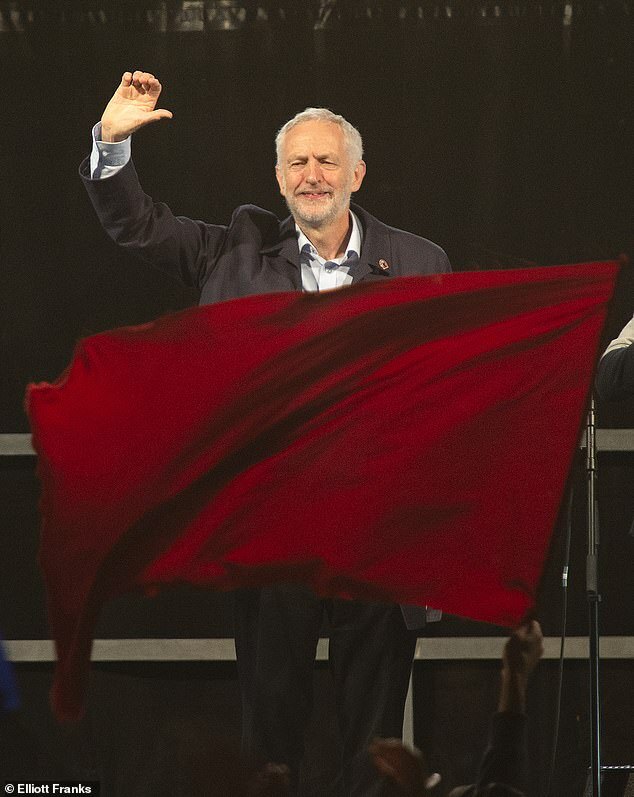 Speaking to thousands of supports, some of whom were waving EU flags, Corbyn said: 'We've got big issues coming up in Parliament in the near future. Corbyn hinted that the best way to settle the issue of Brexit was to hold a general election'We will challenge this Government on whatever deal it brings back, on our six tests - on jobs, on living standards, on environmental protection and protection of those jobs and the ability of an incoming Labour government to invest and intervene in an economy to bring about decent wages, jobs and full employment. Shortly after getting off stage, Corbyn posted a picture of himself addressing the crowds on his Twitter page. Shadow chancellor John McDonnell had taken to the stage earlier in the evening, also indicating that he was willing to take the fight to the Conservative should there be another General Election. McDonnell said: 'The Tories hate each other now more than they hate us. Earlier today, McDonnell said he did not want to take the 'option of a people's vote on the table' after Labour has come under increased pressure to back another Brexit referendum. He added that the Prime Minister should call another general election following her break-down in talks with Brussels. Despite the Labour leadership calling for another general election, twice as many voters believed the party was more 'decent' under Gordon Brown than the current leader. 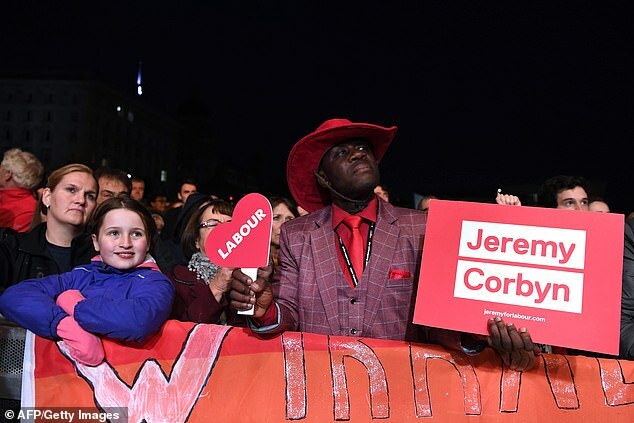 A new opinion poll by ComRes for Jewish News found 48 per cent considered the party was more decent when Mr Brown was leader as against 24 per cent who thought it was under Mr Corbyn. 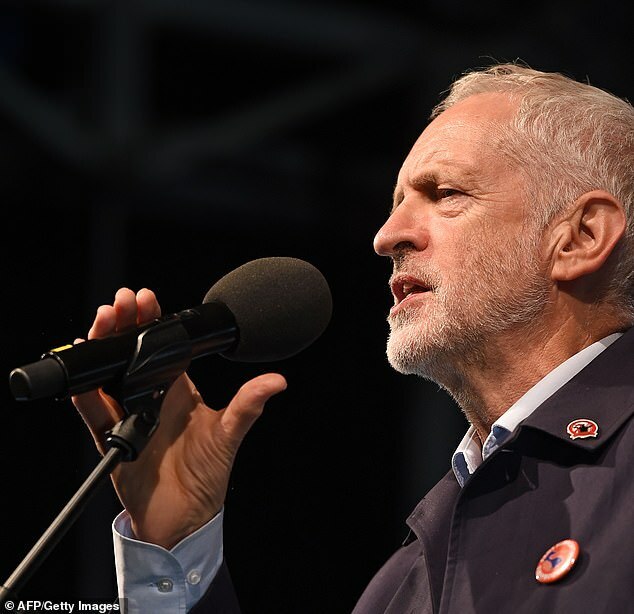 Following a string of headlines of alleged anti-Semitism within Labour, half of voters said the party was doing enough to stamp out the issue, while just 19 per cent thought it was. Nearly a third of voters, 31 per cent, said Labour deserved the title 'the nasty party' - nearly as many of the 34 per cent who believed it belonged to the Tories when the term was originally coined. The ComRes survey was carried out on 2,002 British adults online between 19 and 20.